The captain of the Shohoku judo team, Tatsuhiko Aota is a childhood friend of the Akagi siblings, having argued with Takenori over which sport was better, judo or basketball, since their youth. This grudge continued until their present age, where their feud is over which team will be National Champion first. 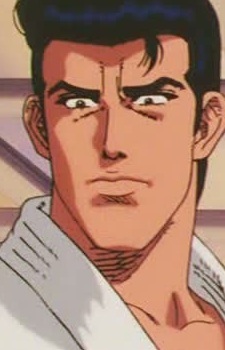 He once tried to make Sakuragi join the judo team because he considered his fighting skills exceptional, and to achieve this, "bribed" him with some photos of Haruko when she was younger. Still, Sakuragi refused, saying simply, "because I'm a basketball player" (actually because he knew he would actually be closer to Haruko if he stayed with the basketball team). But Tatsuhiko does not give up on trying once in a while. He is rather loyal to Takenori when the need arises, cheering him on when he is outplayed and hard-pressed during the second Ryonan match. Despite his inability to physically coerce Sakuragi into joining the judo team, Tatsuhiko has proven that he is skilled, as he is the sole member of the judo team to qualify for the National Championships in judo. It is also worth noting that Tatsuhiko has had a crush on Haruko since they were young. She calls him "Ta-chan" instead of by his last name, which irritates Sakuragi immensely.